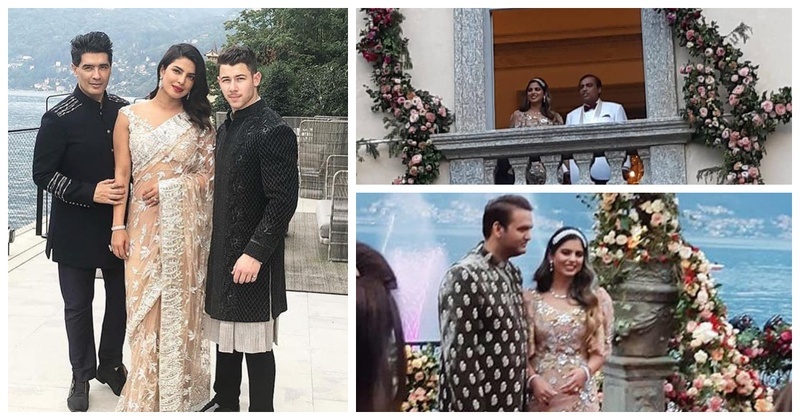 All the insider pics & deets from Isha Ambani and Anand Piramal's dreamy engagement at Lake Como! Anand Piramal popped ‘the question’ to Isha Ambani a couple of months ago and she obv said yes in a heartbeat. While not a lot is known about this tight-lipped love story, the proposal sure did take the internet with storm. So, when the time came for the official engagement ceremony, the Ambanis made sure to leave no stone unturned. With the themed lunches, gala dinners, and dress codes for each event, the Ambani-Piramal engagement has been giving me some major #RegalVibes and seems to be an Indian version of a Royal Wedding! P.S totally love how her brothers Akash and Anant followed them too with her sister-in-law Shloka Mehta. And do you see the girl in the red dress? Well here’s hoping she’s Radhika (Anant’s GF peeps)! Also, I for one am in LOVE with her dusty pink embellished gown with a long trail. And here’s a pic of Isha Ambani sitting along with Mukesh Ambani, while Anand seems to be saying a few words. John Legend sang 'All Of Me’! YES you read that right. John freaking Legend sang “..Cause all of me, Loves all of you..”. And my heart seriously skipped a beat. Priyanka Chopra and Nick Jonas made a stunning couple both dressed in Manish Malhotra, posing with the designer himself! Anil Kapoor looked his dapper self in a back tux! With the Engagement like this, I can hardly wait and imagine what the wedding might look like!